A review by Sound Connections Director, Philip Flood. As 2015 draws to a close I have been reflecting on the enormous variety of projects and partnerships which Sound Connections has been involved in over the last 12 months. Our core mission – to develop, enable and empower young Londoners through music however remains constant and vital support from Youth Music, through three year strategic funding to 2018, was confirmed early in the year. As a result, we have been able to grow our two main practitioner networks, supporting those who work in early years settings and musicians who work with children and young people in challenging circumstances, and work with more young people in the capital. Our early years apprentice scheme has developed considerably with five new trainees, who benefitted from mentoring, training and work shadowing opportunities at an early stage of their careers. The Challenging Circumstances Music Network has also developed significantly over the year with record attendance at our conference at Cecil Sharp House in November, delivered in partnership with the English Folk Dance and Song Society. This important gathering enabled us to celebrate and share the achievements of many colleagues and organisations who place inclusive practice at the centre of their work. 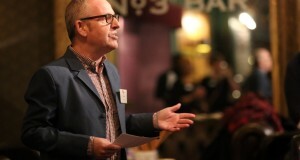 Wired4Music, our youth voice engagement programme, celebrated its fifth birthday at our ‘Would Like to Meet…’ essential networking event in July at the glorious 1901 Arts Club in Waterloo. This was also an opportunity to highlight our leadership programme supporting five young people develop their own musical projects and learn from each other. We have also recently launched our Re:Wired micro site, which hosts the initial findings from our youth voice research across England. The site also contains a wealth of resources which will be updated regularly. We continued to support London’s classroom music teachers with Teach Through Music, our flagship KS3 CPD programme, delivered in partnership with Trinity Laban, Barbican, University of Greenwich and Trinity College London, with a series of short courses and events hosted by the Southbank Centre, Barbican and the Royal Academy of Music. The programme culminated in a final conference at the stunning Laban building in Deptford and hosted by Trinity Laban. We are currently in discussion with the GLA about how we can sustain this vital work in the future and develop a dynamic pan London network of secondary music teachers. Just over a year ago we launched Sound Solutions, our new consultancy service, in response to an increased demand for our products and services. We have been working with a number of London music hubs, including Greenwich, Islington, Newham and Redbridge, helping them to improve and respond to their work with children and young people. We have also been delivering specific projects for a number of cultural organisations, including the Academy of St Martin’s in the Field, Barbican, EFDSS and the Roma Support Group. Our work outside London is growing, with projects in Brighton, Bristol and, currently, Essex. Please do contact me if you would like to explore how we could support your work. Sound Connections continued to advocate and campaign for high quality music opportunities for children and young people in the capital, and most especially for those who faced significant barriers to accessing them. Our Youth Music funding has enabled us to identify and promote inclusive practice and we will continue to develop this as a core theme over the next three years. We are also working with A New Direction on how we can most effectively support the newly launched Cultural Education Challenge to ensure that music practitioners, organisations and music services are fully involved. Wired4Music have recently launched a survey for young people in London to contribute to the Baccforthefuture campaign. We are also part of the Paul Hamlyn Foundation funded Inspire-music initiative which is designed to help make musical learning more consistent, higher quality, more diverse and more sustainable for children and young people in England. Sound Connections continues to be part of the Executive Committee of the Music Education Council (MEC) and a member of the Mayor’s Music Education Taskforce. None of these achievements would be possible without the specialist knowledge, expertise and commitment from the staff and Trustees at Sound Connections and I would like to thank them for everything they have achieved during the year. I also want to thank the many partners we have worked with across the highly diverse music education sector in London. I strongly believe that London’s rich music offer for children and young people is more effective when we work together, respond to the real needs of children and young people and are fully inclusive in our approach. Wishing you all a restful and enjoyable break.